Sunday was the third and unfortunately final day of the Emerald City Comicon, but it would hold the distinction of bringing me face to face with one of the true icons of both the super hero and science fiction worlds. This would truly be a day to remember and not just for having to wait two hours in an autograph line or for not being able to find an empty seat in an overfilled auditorium. When it comes to conventions like this, waiting in lines and fighting through crowds requires the patience and fortitude of a Spartan soldier like the one seen above. For some reason this is the only costume I chose to take a picture of. I guess part of it was due to the amount of time spent in the autograph hall where picture taking of any kind is frowned upon and the staff members will be quick to remind you if you choose to disobey their rigid rules. Meeting Sir Patrick Stewart was truly an honor and he was more than gracious in sharing a word or two with every single person even as he efficiently worked through the line of people who were all willing to fork over their cash for a few Sharpie provided scribbles and a moment of eye contact with the legendary captain of the star ship Enterprise. He was genuinely kind and seemed to be having a good time interacting with this never ending supply of Picard and Xavier fans. During Stewart's panel discussion, he truly owned the crowd as he paced back and forth across the stage telling tales of how he became Captain Picard and what it was like working with everyone from Sir Ian McKellan and Hugh Jackman in the X-Men movies to Liam Neeson and Helen Mirren during his days on the set of 1981's Excalibur. His best story out of all of them was from the audition process for Star Trek: The Next Generation. At one point he was asked if he had a hair piece that he could wear as the casting director wanted to see him with one on during the audition. Stewart said he did have one, but he had left it back home. Next thing you know, the hair piece is being hand delivered, at Paramount Studio's expense, straight from London and directly into his own hands in a far corner of the LAX airport. 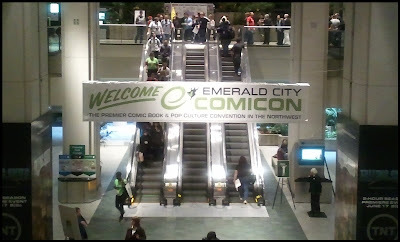 With Mr. Stewart's panel coming to a close, it also marked end of an incredible three days at the Washington State Convention Center for the Emerald City Comicon. I had a great time and came away with some really cool stuff to go along with all the great memories and now its time for my Comicon wrap-up to also come to an end.